How can I create a help button that looks more “professional”? look more like a "canonical" help button. If we take a look at most programs, these types of buttons have a distinguished stylization. How would I achieve this in Mathematica while keeping the same structure of my above code? A couple of images that come with Mathematica. Caveat: There's no guarantee that they will be present in all (future) versions. 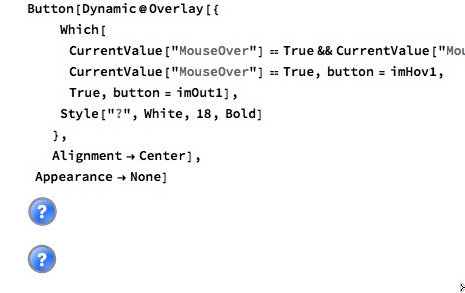 Here's the general way this type of thing seems to be handled in the built-in things plus code to build the type of buttons you want. When I tried using the methods described here based on the Appearance option for Button it seems that only bitmaps were valid, i.e. primitives didn't seem to be valid ...unless I have not coded correctly. I normally prefer not to use bitmap images in interfaces because the aesthetics breaks down when the magnification changes -- you can always lock that down but not ideal for your users. Appearance differs across platforms as well. So in an ideal world buttons and controls based on primitives are better. Not the answer you're looking for? 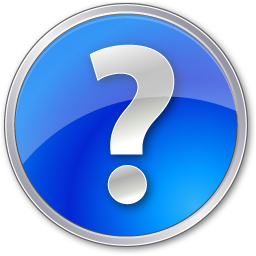 Browse other questions tagged front-end customization style button or ask your own question. What is the most effective way to setup a Notebook with transparent background but solid contents? How do I change the pressed button appearance? Can Button generate output without using Print? Is it possible to create a button that shows another button on Manipulate[ ] function? Color Shading Parts of an Output Expression - Is it Possible?